Andrena Crockett returned to her alma mater in 2015, as Georgetown University unveiled the discovery of 272 slaves who were sold into an institution that would build the very foundation of their own. But the proceedings revealed how much of her people’s past was still shrouded in mystery. The former junior high school teacher looked to Black Georgetown Remembered for answers, but wasn’t satisfied. If the Jesuits were known for their meticulous record keeping, why were there so many holes? Over the past three years, Andrena has done just that—sifting through archival materials, gathering information from sources in Black Georgetown Remembered, and organizing the descendants, of which there are 6,000. 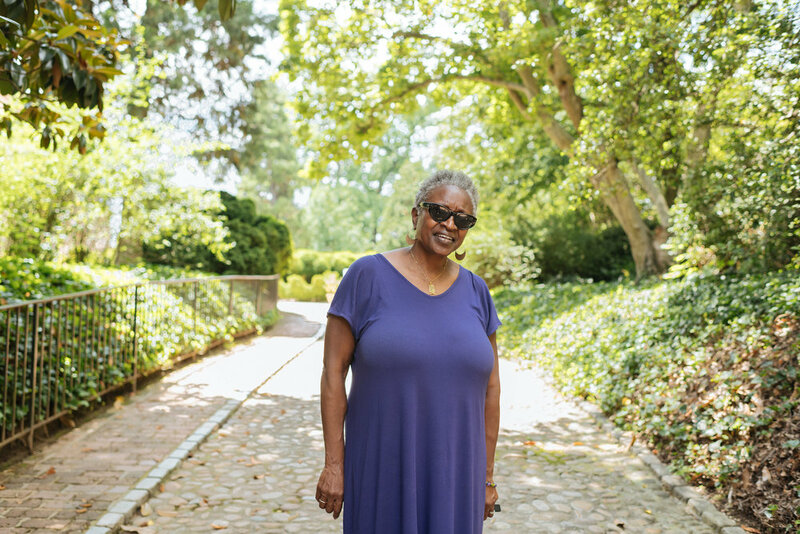 This summer, she launched the Georgetown African American Historic Landmark Project (GAAHLP)—a collective of Georgetown community advocates and historians, including the Urban League, who are undertaking the task of honoring the free and enslaved residents who lived in and worked to build Georgetown by placing markers on approximately 80 historic African-American landmarks. There are 53 recorded interviews on file with African-American Georgetown residents. Andrena has secured publishing rights from five of those families—one of whom shared their descendant’s marriage certificate, death certificate, and children’s birth certificates. She’s working on the rest—all of which paint a rich and complicated picture of life as a black man, woman, or child in Georgetown. Consider the woman whose family split in two, half remaining in Georgetown while the others moved to Baltimore and passed as white. The 6-year-old boy who was denied service at the five-and-ten store. His father, a renowned doctor who rode up and down P Street on his horse, treating the entire community. The number’s runner during Prohibition, likened to Al Capone. A ladies man named Eugene, photographed in a suit and flanked by adoring women. Those are but five of the stories previously untold. ‘You have the prim and the proper, the scoundrels drinking alcohol, the doctors on their horses, the slum folks, and the people rolling their eyes at them—and that’s just the African Americans. Black, white, slaves, freed, indentured servants. All working side-by-side in the most prestigious part of DC. That was the story of Georgetown. More than 50 years after discriminatory public housing policies and gentrification pushed African Americans out of Georgetown, Andrena says everyone must reconcile the past to move forward—acknowledging and honoring the generations of black Georgetowners who built and contributed to DC’s oldest neighborhood. Over 80 bronze historical markers serve to spark this very discussion—recognizing everything from a Georgetown waterfront once used as a Middle Passage slave trade port, to the home of freed slave and business owner Yarrow Mamout. Andrena hopes to debut the first marker in September during Congressional Black Caucus weekend, though all will have to go through the Old Georgetown Board. Half of the stories behind the markers are already on the GAAHLP website, with the rest to follow in the coming year. Andrena is inspired by everything she’s uncovered, though many questions still consume her. Among them—why some African Americans rose to the top and others didn’t. Why did Yarrow Mamout—a slave until the age of 60, who lost his money not once, but twice—become a revered historical figure, while others were labeled undesirable? Why are some stories told, and others aren’t? Then it’s up to an entire community to go tell it. Photos were taken at Tudor Place in Georgetown.